A lot of unusual things happen in the garden. I would wager most go unnoticed by most gardeners. I find these odd happenings interesting and I like to share them on ThriftyFun. Well, here's one that has left me flabbergasted. I even sent pictures to my ag agent and am awaiting his reply. I have two wisterias I am training as standards. (With most plants, training them as a standards is optional. With wisterias, it is almost a necessity. It is about the only way to keep them at a manageable size. Otherwise, you would have 50-75 foot vines crawling everywhere). I've covered parts of this in other posts, so bear with me. I found wisteria seed on a sidewalk, brought them home and planted them. That was twenty years ago. For the first fifteen years, the plants stayed in small clay pots above ground. They stayed rather small, they never bloomed. Then I gave them a place in the ground. They doubled in size in no time. It was another five years though, before one finally bloomed. The other, I thought had died. I blamed it on the 3 degree weather we had. I decided to saw down the 'dead' wisteria. I never got around to it. After a month, I began to see bits of green on one limb. Well, maybe only one side was dead. I waited. 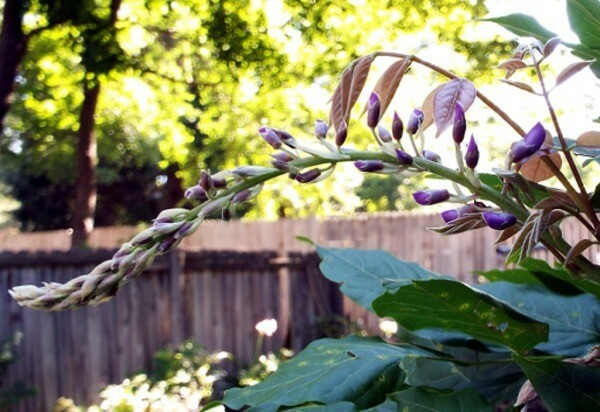 Within a few weeks, the wisteria had completely filled out and looked as healthy as the one that bloomed. I was glad it hadn't died. I had made it the focal point of my back yard. Today I noticed a bloom bud on it. I had been pulling all the tender new shoots off to help it keep a tree form. There's no telling how many potential bloom buds I have pulled off. I won't pull any more, at least for a while. 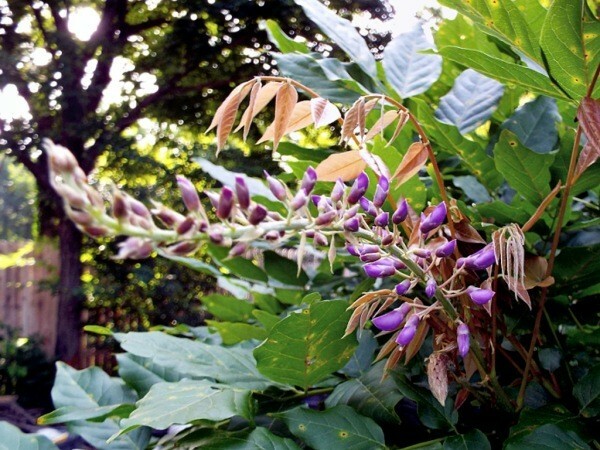 Wisteria are among the earliest plants to bloom, around early to mid spring, long before the leaves are mature. Well, it's now June 27. The wisteria has long been covered in leaves. And now, it decides to bloom. I waited twenty years for these wisterias to bloom. When I saw bloom buds on the first one, I was overjoyed. But sadly that 3 degree weather killed them. And there were no bloom buds on the second one. I was heartbroken. But wait. Nature is always prepared. There were reserve bloom buds on that first wisteria. A bit of warm weather brought them out. And sure enough, I did see blooms after twenty years. When I realized the second wisteria wasn't dead, I thought perhaps in another year, I will see it bloom, too. I cannot describe to you how I felt when I saw that bloom bud, today. Either Nature is very, very cruel, or trying to teach me patience. While writing this, I got an answer from my ag agent. He says this is very unusual. He can only attribute it to the abnormal weather we've been having. Whatever, after waiting twenty years, my patience paid off. Not once, but twice. Quite frankly, I think Nature owed me this. 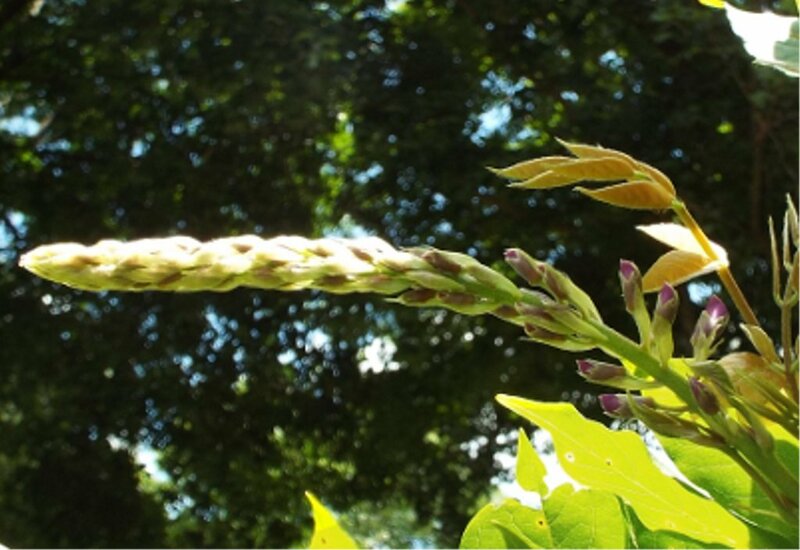 If/when this bloom bud mature into a full size panicle (I see no reason why it shouldn't), I will post a picture. Not only that, if I get several blooms, I will call the local newspaper and ask if they are interested. It's Summer time. Can you believe this? 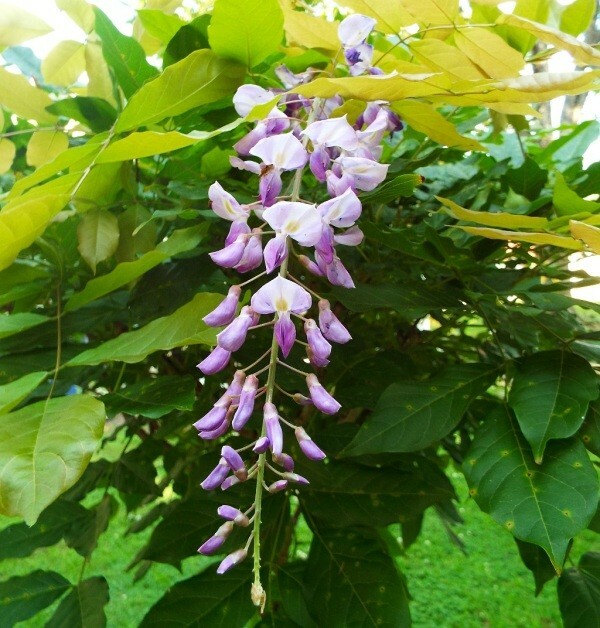 Your photos are great and it looks like your Wisteria is blooming its heart out for you! Doesn't it sound like music to your ears and make you smile with pleasure? I just love it when my plants surprise me with unexpected blooms. It sometimes makes me want to sing "Happy Days Are Here Again"! I hope the newspaper has a good garden editor and knows the difference in why this is a rare thing. Thanks for sharing your Wisteria moment in history. As it turns out, there will be only two blooms on the Wisteria. This picture is of the second. I have not one complaint. My twenty year wait is over. Hallelujah! So, I was wrong about 'last entry'. I ran across this picture and had to post it. I took this picture a few years back, while visiting my sister in another town. This wisteria is being grown by someone living close to my sister. It shows the unlimited potential of growing a wisteria in tree form. Beautiful, yes? I don't plan to let my wisteria take on such a pendulous effect, though. I plan to keep it in more of an umbrella shape. We had a tree in Ohio just like this! 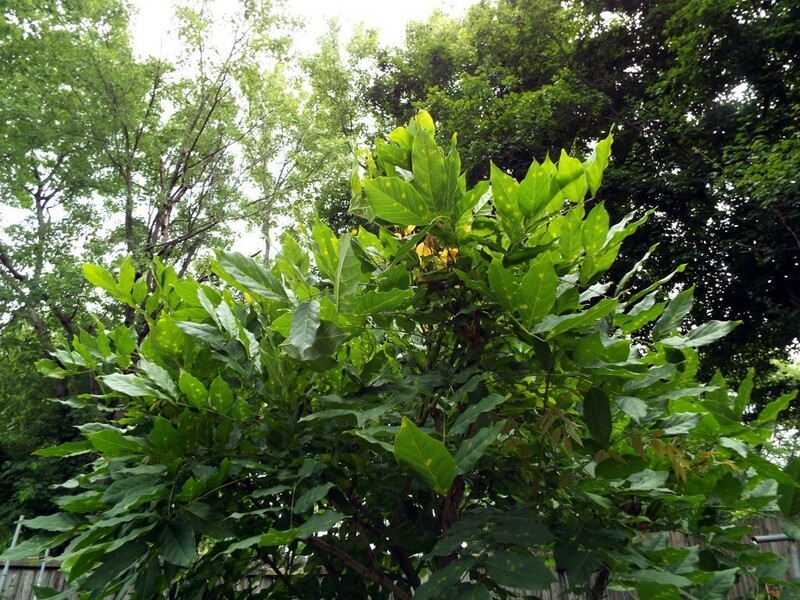 It was one of favorite trees on the property. I have heard wisteria can be invasive, but I never experienced that. I have always liked Wisteria and had one at a previous location that - as you said - was at least 30 feet long growing along a fence line. 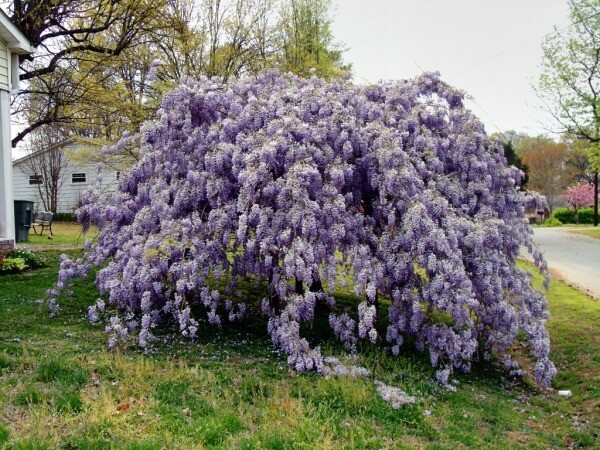 I'm now planning on using this method of growing one as a tree but I have just found out that there are actually 3 different kinds of wisteria - this I did not know so now I am going to research the difference before making a purchase. Perhaps you know the difference (if there really is one or if it really matters?) and can let me know.